Product information "iM980A US LoRaWAN - Long Range Radio Module"
The 'iM980A US LoRaWAN' is a compact and low-cost radio module that operates in the unlicensed 915 MHz band and combines a powerful Cortex-M3 controller with the new LoRa® transceiver SX1272 of Semtech Corporation. A sensitivity of down to -137.5 dBm and a maximum output power of +17.5 dBm results in a link budget of more than 155 dB. 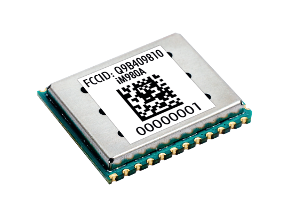 The 'iM980A US LoRaWAN' has received Federal Communications Commission (FCC) CFR47 Telecommunications, Part 15 Subpart C modular approval in accordance with Part 15.212 Modular Transmitter Statement about FCC. The LoRaWAN™ protocol stack, specified by the LoRa Alliance, is based on IBM’s LMiC and IMST’s WiMOD-OS. It enables Low Power Wide Area Networks (LPWANs) for Internet-of-Things (IoT) and Machine-to Machine (M2M) applications and supports Direct or Over The Air Activation (OTAA). It comes with the WiMOD LoRaWAN™ HCI interface and allows easy configuration. Please refer to the download section. LoRaWAN™ is a trademark of LoRa Alliance™, LoRa® is a registered trademark of Semtech, Corp.
Related links to "iM980A US LoRaWAN - Long Range Radio Module"
Customer evaluation for "iM980A US LoRaWAN - Long Range Radio Module"